anyone traveling through Utah's gorgeous landscape may be curious about the people who have lived there over time. Anyone who's ever heard of the Mormon Trail may be piqued to learn more about that extraordinary journey and its place in history. And anyone who lives in the Beehive State may find that exploring stories close to home is uniquely exciting and enriching. 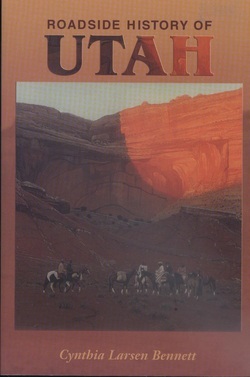 Roadside History of Utah will satisfy all these readers with its captivating historical tales and insightful commentary. Roadside History of Utah offers an abundance of compelling stories about Utah's exceptional people, along with over 150 historical photographs. Cynthia Larsen Bennett's thorough research and lively storytelling give residents and visitors alike a new appreciation for the Beehive State and its turbulent past. Paperback, c2008 , xiv, 401 p. : ill. ; 15 cm. Includes bibliographical references (p. 378-383) and index.